Thomas Slater known as "Parson Slater of Shottle" is a less well-known relative of Samuel Slater, who cornered all the glory by going out to America with the concepts of mechanised cotton-spinning in his knowledge and passing them on to the Americans, thus becoming the "Father of the American Industrial Revolution" and consequently rivals to the British trade. Samuel Slater after an aprenticeship by the Arkwrights and Strutts, built the world's first successful water-powered cotton mill in Pawtucket in 1793, and Pawtucket was home to a thriving textile industry for the next 150 years or so. Thomas Slater by contrast was a humble local preacher from 1770. He preached in every town, village and hamlet in the County of Derby. He opened his house at Shottle in 1767 to the Methodist Preachers who regularly visited it in the “Derbyshire Round.” In 1816, the Shottle Chapel was built on his ground. Thomas Slater of Shottle is the uncle of Samuel. His father was also named Thomas: Thomas Slater married Mary Alcock, and they had, as well as Thomas in 1738 and William in 1728 (father to young Samuel as above), Samuel (1733), John (1742) Grace, Ann and Hannah. This Memoir below tells the story of the conversion of Thomas and his setting up a Chapel in Belper. The original chapel is now in the grounds (once the graveyard) of the present Weslyan Methodist Church on Chapel Street, Belper. The land was owned by Thomas Slater. Notice that this Memoir is written by Joseph Taylor - the Taylor family is as ever in the forefront of Dissenting Religion in Belper. The venerable Mr. Thomas Slater, of Shottle, near Belper, was a Local Preacher upwards of fifty years, and preached the first Gospel-sermon I ever heard. He visited Duffield, the place of my nativity, about the year 1770; and met with the treatment which might be expected from an ungodly multitude: but he bore it with patience and fortitude. He came frequently, and preached in the open air while the weather would permit; and then procured a small dwelling-house for the winter season. He formed those of us, who were under religious impressions, into a small society, of which he was the leader; and although he had each week to walk three miles to meet us, and to return, I never knew him hindered by any kind of weather. But Duffield was not the only place where he planted the Gospel: his love to the souls of men carried him to all parts of the surrounding country. He was a means of beginning the good work of God in more places than any man I ever knew! His constitution was remarkably good and strong; and he never spared it in the least. Some years before I began to travel, I, and a few more young men, used to go with him from village to village, where he preached the Gospel of the kingdom, and we assisted him in singing. He preached some hundreds of sermons at my native place, and had always something to say which was interesting to his hearers; and many persons, during those seasons, were awakened and converted. When I went out to travel, in the year 1777, he engaged to see me once in two years, unless my Circuit should be more than one hundred miles from Derby. To this promise he punctually attended, and preached in those places where I was stationed, with great acceptance. I am indebted to his son, Mr. John Slater, who has for many years been a Local Preacher in the Belper Circuit, for some account of his father, at a more early period than when I first knew him. He says, that his father was born in August, 1738. When only four years old, he had contracted so great a taste for reading, and particularly the holy Scriptures, that the neighbors used to say, he would be a Parson. And from his attachment to the word of God, his parents had some thoughts of giving him an education suited to the Christian Ministry. But as he grew up, he became careless, though not grossly immoral. About the twentieth year of his age, he entered into the marriage-state, and, soon after, heard a Clergyman preach in Duffield church, on the subject of the General Judgment. Under this sermon, God showed him his awful state, and convinced him, that he was not prepared for the scrutiny of that day. His distress was indescribable: but, alas, the Minister showed no way to escape the wrath to come. Believe on the Lord Jesus Christ, and thou shalt be saved, would have been seasonable advice; but it is not improbable that the Minister himself did not know the remedy which God has provided for sin-sick souls. He continued to call upon the Lord for mercy; but often concluded that there was no mercy for so vile a rebel as he felt himself to be. These deep waters through which he passed, taught him to sympathize with people in like circumstances, and he had always suitable words and feelings for the weary and heavy-laden. The Lord, however, would not suffer the spirit to fail before him, nor the soul which he had made. He proclaimed liberty to the captive, and said to his troubled breast, "Peace, be still." This joyous event he told to his wife, and to another friend; and declared his assurance that all his sins were blotted out. But having no one to speak to, who had received the same blessing, and being ignorant of Satan's devices, he soon began to doubt the reality of what he had received: he unhappily gave up his confidence in God; and thought that all which had passed in his mind was nothing but delusion. He now concluded that his case was desperate. A stone-mason, who was a member of the Methodist Society, came from a distant place, to erect a barn for him. This man, having the love of God in his heart, began to talk about Jesus Christ, and about being converted to God. He sang hymns, and prayed with Mr. Slater; whose drooping hopes of salvation soon began to revive. He also invited him to a place called Crich, where a little chapel had been built, that he might hear the Methodist Preachers. He went, and the trumpet did not give an uncertain sound. He heard the truth, the whole truth as it is in Jesus: and the second time he heard, God set his soul at perfect liberty. This was in the year 1765. The preacher was Mr. Joseph Gilford, and his text was, "Is there no balm in Gilead," &c.
Mr. Slater stood all the time the sermon was delivering, and the floor was wet with his tears. At the close of his discourse, the preacher inquired, why the spiritual health of his congregation was not recovered? The cry of Mr. Slater's heart was, Lord, why is not my health recovered? The Lord gave him all he wanted. His cup overflowed, and such great grace rested upon him, that the change was manifest to nearly the whole congregation. He was so filled with the spirit of prayer and praise, that he could scarcely contain what he felt! At the close of the service, he went through the congregation, shook hands with many of them, and declared what the Lord had done for his soul. He had now five miles to return home; but how to perform his journey, he knew not. His mind was so carried above, that he found it difficult to keep the road. However, that he might give full vent to the feelings of his heart, he turned aside into a piece of waste land, and continued upon his knees, blessing and praising God for about an hour; in which time, his clothes were nearly frozen to the ground. He immediately erected an altar to the Lord in his own house, and called his family to the sacrifice. He became mighty in prayer. So great a gift for that holy exercise is indeed seldom known. He found room in his heart for all his neighbors, and ardently desired that every one of them should know the Lord. He invited them to go with him to the place where he had found the pearl of great price; but the distance of five miles was thought too far; many of them soon began to grow weary and faint in their minds. But Mr. Slater continued with increasing vigor, and spared no labor to find food for his soul. He constantly met in class at this distant place, and hardly ever omitted to improve that means of grace for several years together. But having a great, desire that his kindred and neighbors should share his happiness, he invited the Traveling Preachers to come to his house, where he kindly entertained them for many years, and counted it a privilege to have a servant of God under his roof. The neighborhood where he lived was full of darkness, ignorance, and strong prejudices against the truth. And all manner of evil was said of him falsely for Christ's sake; but none of these things moved him: he still invited all to come under the sound of the word, and many were convinced of sin, and converted to God; so that a class was formed in his own house. He lived to see chapels erected in almost all the villages adjacent, and also one raised in his own garden, by a member of his family. The chapel and dwelling-house at Belper stand upon land which belonged to him. One thing in which he particularly excelled, was his attention to the sick. I never knew him decline to visit them on any account. Distance, dark nights, bad roads, contagious diseases, &c.: none of these things could keep him at home, when his help was wanted. And the Lord did great good by him in this way. He always maintained a mean opinion of himself, and of his performances; and he felt a great reluctance to write: on these accounts I am at a loss to mention periods when events connected with his personal history took place. I do not precisely know the year in which he began to preach; but being doubtful that he had run before he was sent, his fears prevailed upon him to decline the work. Mr. Thomas Olivers, who was in Derbyshire in the years 1770 and 1771, encouraged him to begin again. In dependence upon the Almighty, he took the advice, and labored in his Master's vineyard for more than half a century! He never spared himself in the least; and has sometimes performed what is almost incredible. His domestic concerns were never neglected; for he was diligent in business, as well as fervent in spirit. He has left the harvest-work at the same time that his laborers have done, and has gone to a place at a distance of eight miles to preach, and has been ready to begin with them the next morning. In a conversation with Mr. Meek, he told him that he had preached at Leicester, Nottingham, and Derby, on the same Sabbath, and had performed the journey on horseback. In labors he was indeed abundant; and yet, so sensible was he of his obligations to his Lord and Master, that he always considered himself a debtor. Being informed that a great degree of affection subsisted between Mr. Slater and Mr. Everett, and that it was probable Mr. E. had preserved some account of him in writing, -- I desired him to transmit to me all he knew which related to my design. In addition to this, he frequently journeyed into Leicestershire, Nottinghamshire, Staffordshire, Cheshire, and Brookshire, to preach; the greater part of which places were in the Circuit, or 'Round,' as it was then termed. "His conversations relative to the first Preachers were always interesting to me. 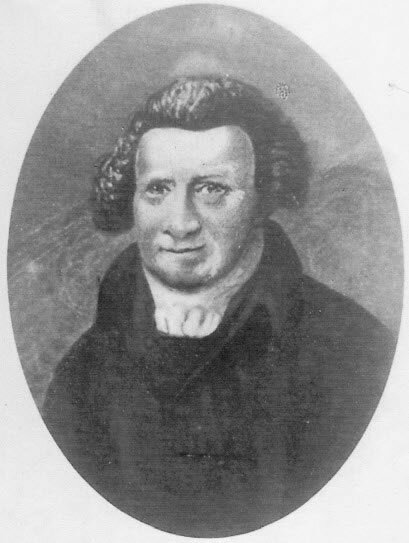 Mr.Thomas Olivers, to whom he was very partial, preached in his house. So did the late Francis Asbury, who was then a youth not quite out of his apprenticeship, and whose voice Mr. Slater used to compare to the 'roaring of a lion.'" About the year 1805, in using a tool, he cut into the cap of his knee, which brought on so great a degree of inflammation, that a partial mortification took place. This was not only a time of sore affliction, but also of great darkness of mind. But it pleased the Lord to heal both body and soul together! His medical attendant told him that he would always have a stiff knee; but feeling a great desire one morning to kneel at prayer, the moment he attempted, the joint was set at liberty, and continued so to the day of his death. Nevertheless, his constitution was very much shaken at this period, and never regained its usual strength. Something like a paralytic affection came upon him, and his mind appeared to suffer as much as his body. His recollection has sometimes failed him when going to preach; but after walking backward and forward for a short time, he has recovered himself, gone to his appointment, and preached as if nothing had been the matter. The last time he preached was in his own house. About the middle of his discourse he made a pause, and said, "You know, my friends, the poor state I am in: I hope you will bear with me." Immediately he recollected what he meant to say, and made a proper conclusion. He often spoke of being cut off from his friends; but his greatest fear was, lest he should dishonor God by his weakness. The last time he was at the chapel was at a Missionary Meeting: he was called to the Chair; with which he appeared to be pleased, because it was another proof that he had still the confidence and affection of his brethren. His strength now began to decline very fast, and he was confined to his bed for near twenty weeks, except about one hour each day. His humility was such, that he ever thought and spake of himself as the most unprofitable of all God's servants. Once, when speaking severely against himself, because he thought his attainments so small, his son said: "Father, if religion were to be purchased, I think you would sell yours at a very cheap rate: you seem to think it of little worth." He answered, "No; not for ten thousand worlds would I part with it." When his friends called to see him, he would speak with the liveliest pleasure forseveral hours upon the subject of his pilgrimage, and the way in which he had been conducted. He prayed frequently and fervently, that the Lord would finish the work in his soul, and that he would bless and save all his family. When his friends prayed with him, although his weakness was very great, his responses might be heard all over the room. To the last his mind was remarkably tranquil; and he died in great peace, September 4th, 1821, aged eighty-three years. He left a widow nearly eighty-five years of age, to whom he had been married about sixty-four years;together with nine children, sixty grand-children and twenty-four great-grandchildren, to lament their loss. Note of interest to genealogists. In 2005 (Mrs) Pat Zipf told me that "I am descended from Thomas Slater, Methodist minister of Belper, through his daughter, Grace. Grace married into the Woollatt family." Download a PDF book by the Belper Methodist Chapel with many photos, and information about Thomas Slater.